Updates — Lola A. Brown, Ph.D. In January, Lola and several colleagues received a National Science Foundation (NSF) grant, led by the University of Maine. The grant is through the NSF INCLUDES Program and is focused on exposing underrepresented high school students to science and engineering. The program has several sites across the country, and Lola is the Co-PI and site director for the New York team. This summer, Lola took students and teachers from KIPP NYC Prep High School (South Bronx, lead teacher: Michael Becker) and Lincoln High School (Yonkers, lead teacher: Dean Saghafi-Ezaz) to the University of Maine to attend a week long summer program focused on the waste water and fresh water treatment and research. The students participated in a variety of activities, including building water sensors, performing tests in nearby lakes, and team building exercises. With this new knowledge, the students will go back and begin a year long research project on water purity, with the support from water management organizations, scientists, and engineers in New York City. Lola to give "The $1,000,000 STEM Seminar"
Dr. Brown will give a seminar "The $1,000,000 STEM Seminar" in anticipation for the PROMISE Summer Success Institute, held by the University System of Maryland. The seminar will provide insight and tips on preparing successful fellowship applications from three former NSF Graduate Research Fellowship recipients. Lola, along with two of her colleagues, were invited to give a workshop to students participating in the MIT Summer Research Program about the National Science Foundation Graduate Research Fellowship and other competitive fellowship. Lola and her colleagues, all of who arepast recipients of the NSF Graduate Research fellowship provided in depth insight into how to prepare the essay, how to get excellent recommendation letters, and what reviews are looking, was extremely well received by the participants and one of the top workshops throughout the summer. 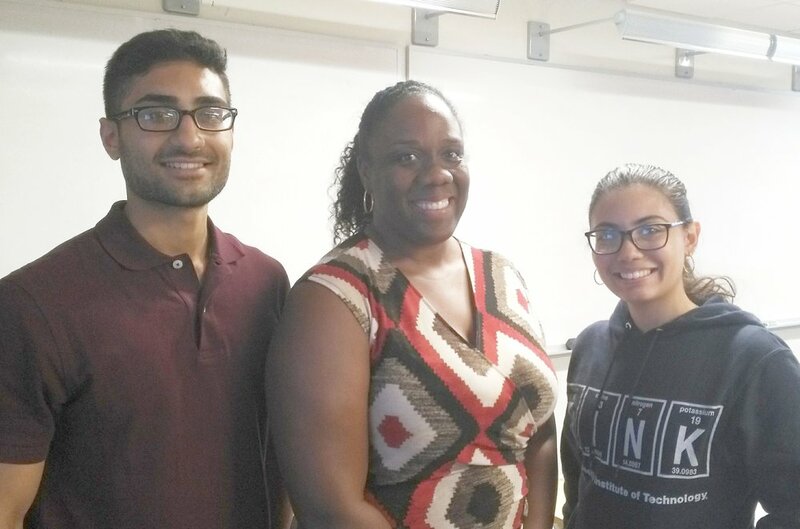 Dr. Lola Brown, STEM education consultant and Assistant Dean of Academic Initiatives at The City College of New York was awarded a $290,000 grant from the National Science Foundation (NSF) in partnership with University of Maine to promote STEM education in high school students. With deep roots in science and education, Dr. Brown’s latest role as Co-Principal Investigator is fortified by her commitment to STEM education. Dr. Brown is a co-investigator of the collaborative, “Creating a Diverse STEM Pathway with Community Water Research,” which secured an award from The National Science Foundation (NSF) for the NSF INCLUDES program. The award, beginning in January 2017, is a two-year grant that will allow Dr. Brown and the team to introduce water research beginning to high schools across the country. Dr. Brown’s collaborative is one of only 37 recipients selectively chosen by NSF to receive one of its first ever awards for the NSF INCLUDES program. With the support from the University of Maine, the $290,000 grant seeks to define a strategic plan to fortify a national alliance to increase the success rate of minority students in science, engineering, and related fields. “The program will mentor students as they acquire skills to research the water quality in their local watershed. It’s a program where tradition meets transition. The students that will participate in the program will have the opportunity to experience engaging classroom settings that address unique community problems,” said Lola Brown, Co-Principal Investigator. “There is great motivation to shape and ensure the success of a future workforce that will help solve the world’s complex issues. Thinking and investigating locally will help students in underserved areas operate on a global level to solve universal issues,” said Brown. “Creating a Diverse STEM Pathway with Community Water Research” was built on the idea that implementing merit-based inclusion in STEM fields will promote the progress of science and advance both national and global health. A prestigious award from The National Science Foundation for the NSF INCLUDES program will propel national efforts to empower future innovators. Last week, Yale had their annual Black Solidarity Conference. I was invited to serve on a panel to speak the future of blacks in STEM. It was a powerful experience. There were three black people on the panel, and of which, I was the only woman. As the student moderator asked questions, I looked out on the audience of black, brown, mocha and caramel faces, I saw myself 15 years earlier- a senior in college, excited about my road head, feeling like I could (and WOULD) find the cure to sickle cell anemia. Then I flash backed into my current day situation- an Assistant Dean in a School of Engineering. Wow. That’s crazy. As my fellow panelists made remarks to the questions being posed, I began to remember all that happened to get me to this point- there were life-altering lows, and heart pounding highs. I wanted to give the students before me hope, but also tell my story and speak my truth. So I did. The alluring aspect of my career path spoke for itself- they saw the title, the degrees, the commitment to betterment of our community. But what about what it took to get there? I told them about the moments that I prayed to GOD to take away the pain of being rejected by my peers and sabotaged by my grad school advisor. I told them I would not under any circumstances give up on myself or my goals until I received the degree I had earned long before it was conferred. I refused to wear The Mask of duality and make it seem like it was a walk in the park. It wasn’t … but I remember sitting in those seats as a student wishing someone would give me the uncut version their experience. I think I did that, and I hoped it helped some. When it came time for the students to ask questions, one student raised her hand and started talking about how moved she was to see three black PhDs in STEM disciplines in front of her. She started to cry and share how she never had a black teacher/professor for her a science or engineering courses- not in secondary school or college, and to just see us meant so much to her. Her comments and emotion spoke volumes to me. It reminded me of when I saw Ruth Simmons participate in Brown’s commencement in 2001 in her first year as the school’s president. I didn’t know her, but just looking at her allowed me to see myself, decades in the future. These types of visual and physical images provide insight into the future of what’s possible. Ruth Simmons was that for me, and I am humbled to be that for someone else. The NYCDOE iZone, the NY Tech Meetup and Urban Arts Partnership, co-hosted a panel discussion and celebration on Thursday, July 30th, to bring together educators, policymakers and industry professionals to push forward the integration of Science, Technology, Engineering, Arts & Math (STEAM). Lola was one of the panelists to discuss the importance of engaging urban youth in culturally relevant K-12 STEAM education and how to best leverage the arts as entry points for STEM career pathways. Lola is featured in "Embracing the Real World"
In Embracing the Real World, Chaz Kyser provides a comprehensive look at the challenges new college graduates face. In this text, Lola shares her experience as a master's student at Georgia Tech. Lola, along with two Yale graduate students, present concepts of tissue regeneration to the New Haven community at the New Haven Public Library. Read more here.